After a colourful 24 hours promoting her hew film, ‘Us’ in New York City, Lupita Nyong’o attended the premiere on Tuesday (March 19) evening. If you were expecting more colour for this premiere, you might be disappointed by this transparent PVC offering from Balmain’s Fall 2019 collection. Balmain don’t do things by half measures, so I’m not surprised that the coat is studded, because this look would’ve been quite mute without this detailing. Do I love this look? No, but I don’t hate it either. I just prefer all three of her previous looks over this one. 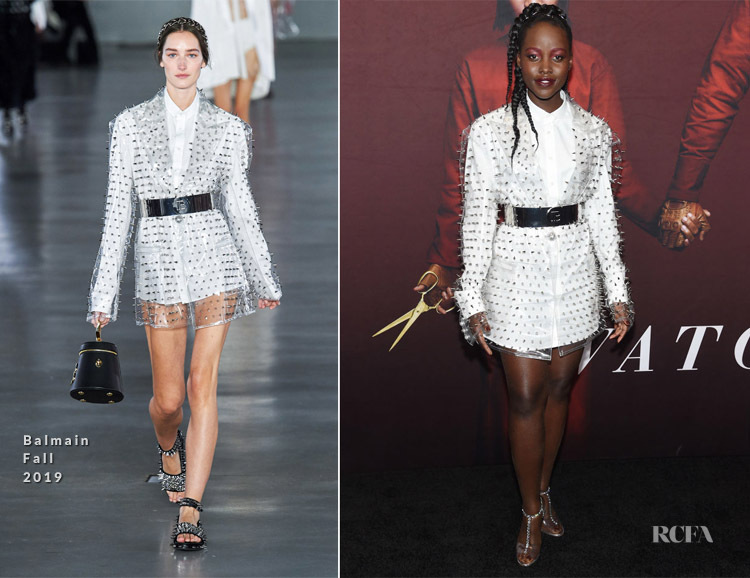 The majority will be glad to see that no coloured contact were used to accessorize this look, just diamante embellished T-bar PVC sandals and a metal belt.